Hi, my name is Linda DiPalma and I am asking for your support in the SunBird Board of Directors election. I moved to the Phoenix area in 2003. As a single woman I was looking for an active gated community and a friend suggested I look into SunBird. It was love at first sight. Over the years I have met such great people and it has been a pleasure living here. Two years ago, I retired from United Airlines. During my 46 years with United I was a Flight Attendant, Flight Attendant Supervisor and Union Representative. Involvement in my community is important to me, so when I retired I volunteered to be on the ACC committee. I enjoy playing golf, and am a member of the Irish Club. It is my belief that in order to keep our Community as lovely as it is today we must plan for the future. We have such a diverse age group from the 50s to 90s, and it’s very important to consider all of our residents when making decisions. It would be my pleasure to represent you on the Board of Directors; please consider me when you vote. I was elected to your Board of Directors in 2014. I served as Board Secretary for the first two years and am currently serving as the Board Treasurer. I worked with other Board members to review and revise the Book of Policies, the By-laws and the Book of Governance. During my tenure I have attended every Board meeting, every Committee to which I was assigned as the Liaison and attended HOA Board of Director training sponsored by the City of Chandler. During the past three years, the main swimming pool was enlarged, the area by the small pool was updated, two bocce ball courts were built, and we just completed the enlargement of the Horizon Room kitchen. All of these projects are paid in full leaving no debt to SunBird thanks to sound financial planning. I live in SunBird full-time and truly believe that SunBird is a great community. The friendliness of our residents, the many activities offered, our beautiful clubhouse and other facilities, our dedicated staff and our financial stability is why I am so glad to be living here. I hope I can count on your vote. I have owned property in SunBird for 10 years and now I reside here full time with my wife of 51 years, Dorene. I have extensive experience in contracting and construction management from my 50+ years in a construction industry, including 36 years as a business owner. We have a son, a daughter and two grandchildren. In retirement, I love spending time with friends and neighbors, the activities, and want to protect the beauty of the neighborhood. My experience from owning a construction company includes a wide range of skills including, goal setting, task assignments, project management and tracking metrics to a successful completion of tasks. But more than just effective skills, I do enjoy building relationships with people. SunBird is about friends and neighbors we live with. My goal is to protect the safety, health and happiness of all our residents. I would appreciate your vote for Board of Directors. I have the endorsement of Chuck Warren, a retiring Board of Directors Member. I am seeking election to the SunBird Board of Directors. In the past I have served on the Finance Committee, the Rules Committee and the Crime Prevention Task Force. I have previously served on the Board of Directors. I have taken classes on HOA Leadership that have covered HOA dynamics in the areas of, law, finance, insurance, mediation, transition, parliamentary procedure, meetings operations and other related topics. During this time, I was invited to become a member of The Leadership Centre Board of Directors, the organization created and taught HOA leadership classes in conjunction with the cites of Apache Junction, Queen Creek, Mesa, Gilbert, Casa Grande and formerly with Fountain Hills and Chandler. I have served on the Chandler City Airport Commission as well as on the Chandler Build Out Committee and the Neighbor Advisory Committee’s Rental subcommittee. In my past career I was a teacher, assistant principal, principal and director of adult education. As the leader of the Adult Ed. program I cared for and fostered a six-million-dollar budget which provided for Adult Retraining, GED, pregnancy, delinquent student HS diploma program and night school classes. Please consider me as you vote. 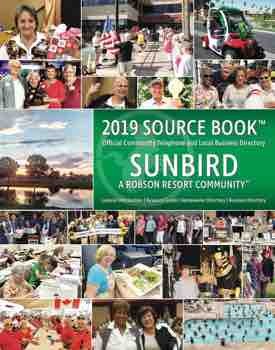 My husband and I moved here to SunBird full time in December of 2001 and in 2006 I ran for a seat on the Board of Directors. After having achieved that I successfully ran for two more additional terms and then left the Board in 2014 at the end of my term due to family responsibilities. I have been on several committees over the years, Vice President of the Italian Club, sang with the SunBird Singers and have co-chaired our Veterans Day program for the last five years. Over the years I also have attended numerous classes and seminars that have been offered by the City of Chandler for HOAs and will continue to do so. Staying educated as to the latest Laws, Legislation and any other information regarding a HOA is vital for a Board Member and it is also essential that the Board keep our Community “forward moving” for our residents as well as future home buyers. I will work for the greater good of our Community without any personal agenda and continue with a conservative view towards our finances. Let me help keep SunBird one of the finest Golf Resort Communities in the East Valley. I am interested in serving a second three-year term on the SunBird HOA board of directors because I believe I have the skillset and a foundation of past experiences to make a positive contribution to the future of our community. I have been a homeowner here in SunBird since 2006. This summer we sold our condo in Oregon; purchased a fifth wheel “home” to park on our son’s farm in Oregon to use during the summer months to escape Arizona’s heat; and are now in the process of making our house here in SunBird our main residence. In addition to serving on the SunBird HOA for three years, I have owned three successful businesses and served on an Oregon HOA board for seven years. If I am re-elected I will work diligently to: 1) Monitor the financial progress of our HOA and work to prevent unnecessary future increases to HOA dues. 2) Have good communications with all homeowners. 3) Continue good relations with Sunbird Golf Club. 4). Look to homeowners for ideas to continue improving life’s experiences here in SunBird. I believe I can be a very effective director for our community and would appreciate your vote. I have served on the Board in the past. I hope I have contributed to the wellbeing of the community. I have attended numerous continuing education programs concerning HOAs, put on by the Leadership Centers of Chandler and have kept up with all new legislative laws concerning HOAs. I’ve enjoyed working with all our members and our Manager Layne Varney and the community. I have been liaison to four committees and certainly understand all the hard work they do for us. I firmly support our amenities and think this Board of Directors has made this the finest, most affordable community in the Valley. We need reasonable, moderate members with common sense to negotiate the business of the board, and I believe that I am that person. For the last two years I have been involved with the finance committee and the rules committee. Graduated from Mercy College of Nursing Sciences in 1975. I have five children and 16 grandchildren. Born in Des Moines, Iowa. I would appreciate your vote and would be honored to be elected to serve on the SunBird HOA Board. Thank you.